Cyclohexylamine has been primarily be used for low-pressure boilers where the condensate has a long run. The BP of 134 deg C is equivalent to a boiler pressure of 30 psi. Cyclohexylamine has the ability to stay with condensate steam for longer runs and at various steam pressures which is not a characteristic of other neutralizing amines available. In case the amine requirement is high then there is possibility of amine carbonate deposit formation. In this case, it is recommended that a blend of other amines be used with Cyclohexylamine for the long run and the low pressure benefits while preventing carbonate deposition. Please refer to your CSL technical representative to offer such blends. 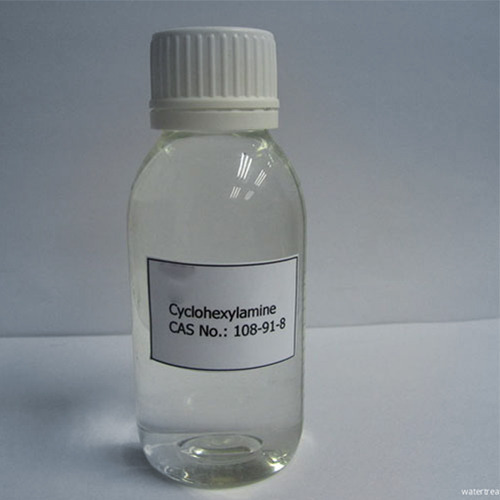 Cyclohexylamine is dosed in the boiler water at the recommended dosage that is prescribed after analysis of water and other system parameters. Please refer your CSL representative to recommend exact dosage. Proper human safety products such as Splash goggles, lab coat, vapor respirator, gloves and boots should be worn while handling and applying chemicals. Splashes on skin should be washed off with water immediately. In case of splashing into the eyes, flush it with fresh water and obtain medical attention. Should not be injected. Please refer MSDS for more details. This product should be stored in original containers in cool and dry place, away from sources of heat, flame and direct sunlight. Please refer Technical Data Sheet, Label and MSDS for more details and shelf life. This product is available in 200kgs HDPE drums and 50kgs jars.